The class of vertebrates, Amphibia, includes animals commonly known as frogs, toads, salamanders and newts. Concern has arisen over a possible global decline in numbers of some species of amphibians. Convincing data to support and document the reality of declines on a global geographic scale have yet to be collected; some researchers believe that for many species, natural fluctuations in population numbers may be a valid explanation for a diminishing population size. Nevertheless, assuming that the general decline is real, and it certainly is for a limited sample, there are a variety of factors presumed to be causes. Such postulated causes include pollutants, pesticides and herbicides, climate change, disease, fungus, introduced predators such as fish, and wetland habitat loss. A discussion of these factors can be found on other websites. This site will focus on one factor put forward in scientific and public media, namely, the increase in ultraviolet B radiation (UVB) reaching the earth as a consequence of ozone thinning in the atmosphere. The discussion here will involve findings from papers which were published in scientific journals. If interested, you can find names and references and read the entire in-depth review in the article, "Shedding light on ultraviolet radiation and amphibian embryos, by Lawrence E. Licht (published in BioScience, June 2003, volume 53:551-561). There are several reasons why I have constructed this site. The hypothesis that increasing levels of UVB is killing amphibians and is linked to global population declines has received a great deal of attention in websites, radio, television, newspapers, textbooks and curriculum guides used in elementary, high school and university level science courses. In this site, I will discuss factors which show that the UVB/amphibian decline hypothesis is, in fact, unsupported when assessed from a logical, realistic basis. I will discuss how this hypothesis has managed to become deeply entrenched in the public and scientific viewpoint about factors causing declines. This will necessitate a look at the procedure of publishing scientific work through the peer review system. Ultraviolet B radiation is that energy from the sun which ranges from 280 to 320 nanometers (nm) in wavelength. The thinning of the stratospheric ozone layer has allowed an increase in the level of UVB that reaches portions of the earth's surface. Energy from 100 to 280 nm (UVC) does not reach the earth and UVA (320 to 400 nm) is not increasing. (Energy from the sun with wavelengths from 400-700 nm is called visible light. 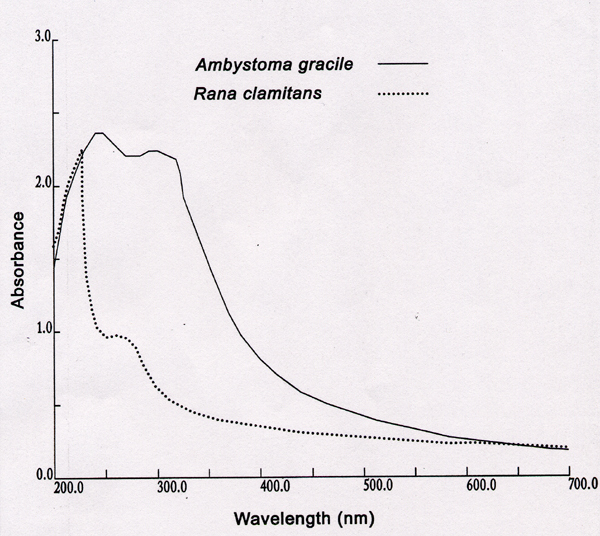 Humans can see visible light radiation but not ultraviolet radiation.) It is primarily UVB that poses a potential danger to amphibians (and sunburned humans), because UVB has the energy to cause damage to cells and organisms. In laboratory tests, UVB can damage DNA within cells and cause carcinogenic, mutagenic and immuno-suppressive effects. The crux of the problem is to determine what amount of UVB will cause damage to an organism, and to establish if the organism is likely to be exposed to that level of UVB in its natural habitat. 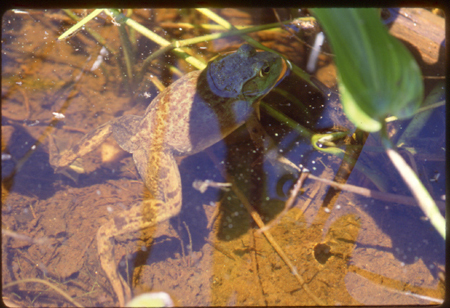 Amphibian species of concern are those that breed in ponds, lakes and marshes and deposit eggs fully exposed to sunlight. After some period of time- days to weeks - eggs will hatch into aquatic tadpoles or larvae which then grow until they metamorphose, leave the water and become more terrestrial. The egg, or embryonic stage, is considered most vulnerable to damage from UVB because the embryos, unlike the larvae or adults, cannot move out of sunlight. The embryo is exposed to ambient sunlight up until hatching at which time the larvae then swim into sun or shaded areas of their aquatic habitat depending on thermoregulatory needs. Thus the experiment that first raised alarm was that amphibian embryos exposed to sunlight containing UVB showed higher rates of mortality than embryos exposed to sunlight which had UVB filtered out. Supposedly, this embryonic mortality was due to the increase of UVB since the onset of ozone layer thinning; such mortality was thus linked to supposed amphibian population declines. To test the validity and value of this hypothesis, it is first necessary to examine amphibian breeding biology and characteristics of the eggs that protect, or, at least, reduce their exposure to UVB. There are five main factors. The water of the pond, lake or marsh used as breeding sites is not crystal clear. The color of the water may range from nearly clear to very turbid (see Figure 1). The color of the water is, in part, dependent on the amount of dissolved organic content (DOC) in the water. The organic matter from surrounding woods and vegetation reaches the pond or lake and dissolves in the water, adding to its dark color. The DOC is very effective in attenuating or reducing the amount of UVB after it penetrates the surface of the lake. The DOC absorbs the UVB energy and thus reduces the amount left to move downward to deeper water. The more DOC, the less UVB that will penetrate beyond just the upper surface layers of water. 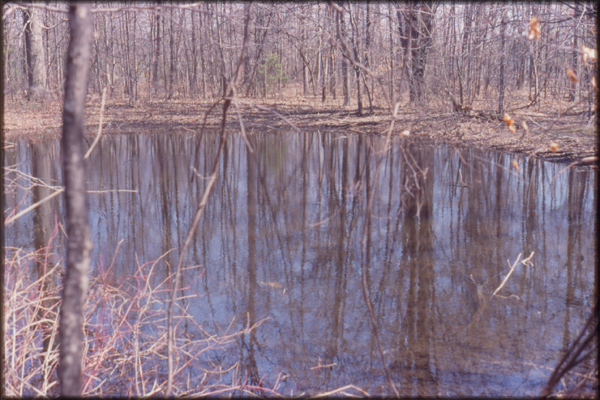 For example, in a marsh with 13 mg C per liter of water, the surface level of UVB was reduced to 55% at just 1.4 cm deep; at 3.0 cm, the UVB was less than 5% of surface values, and at 5 cm depth, the UVB was just 2% of surface. Essentially, for aquatic sites with colored water, surface level UVB will not penetrate beyond the top few centimeters, with nearly all UVB attenuated by 10 cm depth. Furthermore, surveys of high altitude lakes in mountains of western North America showed that even relatively clear water still had enough DOC to attenuate UVB to below the amount of UVB known to harm amphibian embryos. The color of amphibian eggs ranges from a creme to light brown to black. The dorsal side of the spherical eggs shows this color imparted by the pigment melanin. There is a strong correlation with the color of the egg and the amount of sunlight in sites where eggs are deposited. Thus eggs laid out of direct sunlight, hidden on undersides of logs (or in foam nests or plants in the tropics) tend to be lighter in color than eggs laid fully exposed to sunlight. 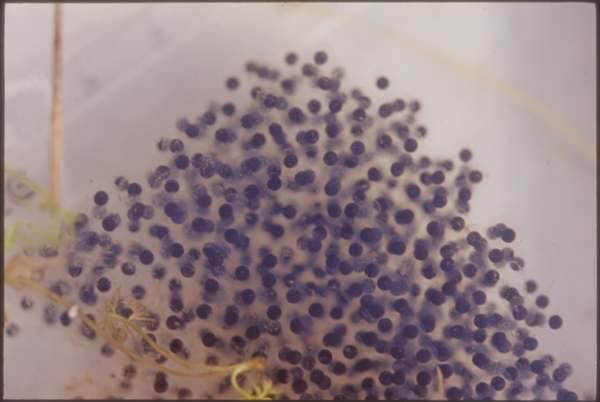 Most frogs and toads which lay eggs in open water in full sun have eggs and embryos which are almost black (see Figure 2). The pigment, melanin, is considered extremely effective at absorbing UVB and preventing its penetration to deeper layers of the egg. (Tanning of light human skin is a consequence of melanin buildup; further burning or damage is reduced by the darker melanin outer layer). Amphibian eggs and embryos contain an enzyme-photolyase-which has the capability of repairing damage to DNA which was caused by too great an exposure to UVB. When embryos are exposed to UVA or visible light at the same time as they are exposed to UVB, photolyase can repair or remove segments of damaged DNA. Thus, in natural sunlight, when the embryos are exposed to UVB, they are also being exposed to UVA and visible light which facilitates the photolyase repair mechanism. The actual amount of UVB that will cause damage to an amphibian embryo is not easy to determine, but laboratory tests with UVB generated by UVB lamps can help establish the harmful levels. Simply put, a lamp can generate UVB at levels far above what is found in sunlight. Embryos can be placed under lamps for a given period of time and exposed to controlled doses of UVB. The unit of measurement is Watts/meter2. Thus the 'flux' or 'irradiance' is administered over a time period and the total dose becomes Joules/m2. Laboratory tests have shown that for many species of frogs and toads, the embryos are resistant to damage from doses of UVB far higher than what they would receive from natural sunlight. This is true even when the embryos are exposed to UVB in clear water that has no protecting DOC. What has protected the embryos? Photolyase, melanin and egg jelly, which will be considered next. 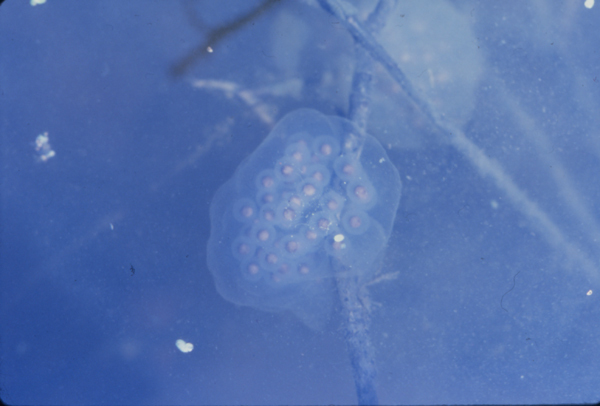 The eggs of aquatic breeding amphibians are covered by a single or several layers of jelly capsules or envelopes. The jelly covered eggs can be laid individually or within a mass of many eggs (see Figure 3). The jelly surrounding the eggs can help protect the developing embryo from predation, desiccation, and toxic chemicals. As well, the egg jelly can absorb UVB. Thus, the thicker the egg jelly and larger the mass, the more effective the jelly is at absorbing UVB and reducing exposure to the enclosed embryos. The absorption capability of egg jelly can be measured. For example, the precise wavelengths which are absorbed by jelly of the Green frog and Northwestern salamander can be seen in Figure 4. For the salamander, up to 99% of UVB at 300 nm is absorbed by the jelly. Measurement of absorbance of the jelly of many species has shown that there is a good correlation between absorbance, the size and thickness of egg jelly and the amount of time the eggs remain in the water and take to hatch. Jelly around embryos which take up to 8 weeks to hatch (e.g., Northwestern salamander) is much larger and thicker than jelly around eggs (e.g., Green frog) which hatch in about one week. The effectiveness of jelly in protecting embryos from UVB exposure and damage can be demonstrated in another way. Frog and toad eggs that still have jelly capsules around them and eggs that have had jelly capsules removed can be exposed to equally high doses of UVB. The embryos that have jelly removed show higher rates of mortality than the embryos that are still surrounded by jelly. Thus, the jelly layers are important at reducing amounts of UVB that will reach the actual developing embryos. Egg jelly is sticky and often, with rain and wind in ponds, the jelly tends to accumulate a covering of plant debris or pond detritus on its surface (see Figure 5). 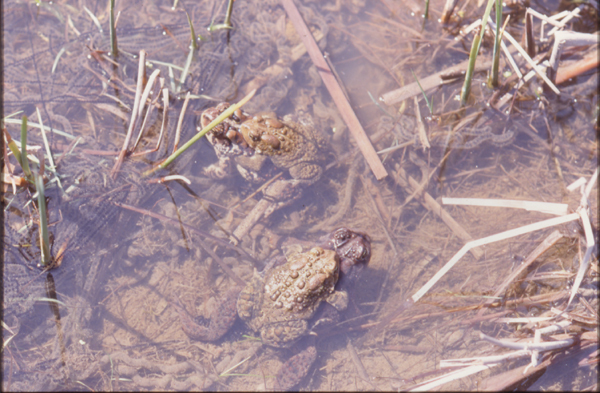 Toads, especially, will lay their eggs on the shallow margins of ponds and their eggs become covered with substrate or plant debris (see Figure 6). This outer organic covering on the jelly will also reduce UVB penetration to the embryo itself. 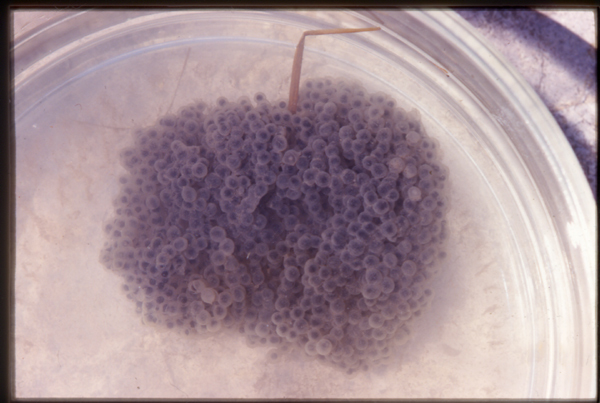 For aquatic breeding amphibians, eggs may be deposited at varying depths. Some species lay eggs in a few centimeters of water whereas other species will spawn at greater depths, even meters. Some egg masses are deposited in open surface water and others are placed on the substrate, on submerged twigs and stems and even on the underside of logs or stones. The deeper the water of natural breeding sites in which eggs are laid, the less UVB will reach the embryos. The five factors described are not the only ones which must be understood to assess the real dangers of UVB to amphibian embryos. The actual doses of UVB which reach embryos in natural settings should be quantified. That would mean recording hours of sunshine, cloud cover and overcast skies during the period of embryonic development. These variables affect the amount of UVB to which embryos are exposed. Together, all these factors must be considered when evaluating the validity of the hypothesis that current ambient UVB is killing amphibian embryos. Since the hypothesis was first published as a scientific paper which subsequently became front page news, there have been many other field and laboratory studies that have attempted to test for effects of current UVB on amphibian embryos. There have also been studies on larval forms and potential damage from UVB. These tests have shown that larvae are more sensitive to UVB than are embryos; yet, most of the tests are not actually of relevance to natural conditions. For example, the larvae are exposed to UVB and not given an opportunity to move out or away from the exposure (see Figure 7). They are usually tested in clear water with no DOC. These tests may be interesting, but not relevant to potential dangers of ambient UVB. The list of amphibian species that have been tested as embryos for potential effects of current ambient levels of UVB is shown in Table 1. The table denotes the finding of significant effects on mortality or no significant effects. As can be seen, there are 9 species with significant effects and 42 tests on 25 species with no significant effects. It is instructive to examine the experimental methods of the studies which found significant effects. When viewed with the perspective of the breeding biology and characteristics of eggs discussed above, major concerns become apparent. These studies suffer from the following problems. 1) Subsets of eggs/embryos were removed from the entire normal egg mass which means that the amount of UVB under testing was greater than the dose that eggs would have received if they had been tested within the whole mass, the natural condition. 2) Eggs were exposed to UVB when held in enclosures that varied in water depth from 5 to 10 cm. These shallow depths were considered as typical oviposition sites, yet for species tested, actual water depth of sites for egg deposition is much greater as recorded in the reports of field herpetologists. 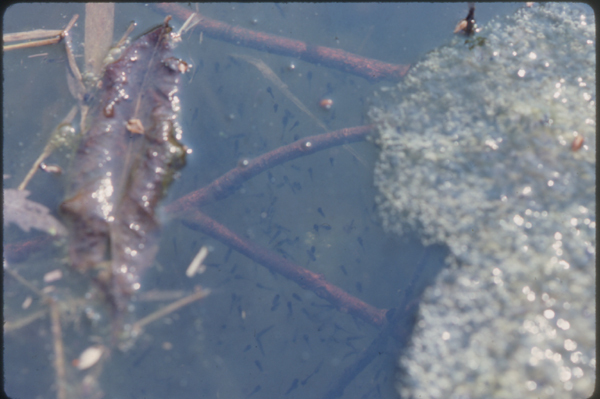 Eggs of species which are typically spawned on the pond substrate or the undersides of logs and out of sunlight, were exposed to UVB in shallow water. Each "x" represents results from a different test. Amphibians evolved millions of years ago. They are adapted to many breeding styles, one of which is to deposit eggs in full sunlight. Actually, there has not been a single documented death of amphibian embryo, larva or adult from exposure to UVB under natural, noninvasive conditions. Nevertheless, let us assume some mortality of embryos which are at the top of egg masses which are at the near surface of the pond or lake, and thus get the maximal UVB exposure. Can this limited mortality of amphibian embryos be then linked to population decline? Mortality of tadpoles and larvae, from predation, is often very high, over 90%. This means that most eggs even with no sun on them at all will hatch and then subsequently die as larvae before they metamorphose. Therefore, limited mortality in the embryonic stage will have little effect on subsequent population dynamics. It is mortality in the post metamorphic life history stage, i.e., the juvenile and adult forms, that greatly affects population trends. The discussion to this point has been to explain how amphibians are protected from UVB and as such to provide an argument as to why the UVB hypothesis has little merit when viewed from a perspective of the natural, realistic environment of amphibians. If my thesis is true, then what is the explanation for the widespread belief that ambient UVB is killing amphibians and linked to their population decline? Now this part of the discussion is not based on as strong a scientific foundation as what was presented earlier. Here we are dealing with media and the power of publicity to spread scientific hypotheses, be they correct or not. The alarm over possible global declines in amphibian populations was first put forward by herpetologists about 1990. The concern was that amphibian populations seemed to be dwindling in number in some habitats that seemed almost pristine, or at least, unspoiled by obvious factors that might cause the amphibians' decline. At about the same time, about 1992, news stories about the thinning ozone layer and consequent increase in the level of potentially dangerous UVB reaching Earth appeared daily in most media. The link between an increasing level of UVB and declining amphibians was a logical one to make and some research groups conducted field tests on the effects of ambient UVB on amphibians. According to Kathryn Phillips who wrote "Tracking the Vanishing Frogs" (1994, Penguin Books), that research was described in the Smithsonian Magazine and the New York Times Magazine. Interviews with the leader of the research team were held on network morning shows. The media attention brought to the UVB hypothesis was very high and international newspapers ran lead stories on how UVB was killing frogs. Subsequent articles on the lethal effects of UVB on amphibians and presumed link to decline have continued to appear in major publications like Scientific American. Throughout the 90's and into the present, magazine articles continue to disseminate the UVB hypothesis. In essence, the hypothesis was formulated and tested exactly when concern over amphibians and detrimental effects of increasing UVB were in the news together. The hypothesis, an alarmist one, became entrenched in the public mindset. As already shown in Table 2, the vast majority of tests done on the potential damage of ambient UVB to amphibian embryos have found no significant effects. So how have results from relatively few papers that reported significant mortality from UVB on embryos managed to become so embedded in public opinion? It appears that hyperbole and continual reports in public media (websites, popular science magazines) have sustained and nurtured the hypothesis. In my opinion, the above discussion on defenses of amphibians against damage from UVB contains sufficient reason to show that the experiments finding mortality are not realistic. What is very intriguing is how scientific papers using such problematic experimental procedures were published. Why did reviewers of such papers not question the rigor and realism of the experimental protocol which was intended to test effects of actual current ambient levels of UVB on amphibians? Here the trail of reasoning becomes less obvious, but there are several possibilities. First let me explain in brief how a paper becomes published in a peer reviewed scientific journal. The author(s) submits to a journal a manuscript containing the details of the scientific hypothesis to be tested; material and methods, results, discussion and conclusion are carefully described. The manuscript is sent to 2, 3 or perhaps 4 reviewers who have knowledge of the area of study under investigation. Normally the reviewers are anonymous and their names are not made available to the author (unless a reviewer asks that his/her name be released). Based on the reviews, the editor will make a decision as to the suitability of the manuscript for publication. The paper can be accepted, rejected or tentatively accepted with some revisions requested by reviewers. This system is probably the best that can be designed to allow peer review of scientific experimentation, but there are some pitfalls. The reviewer is usually someone with expertise in the field of study under investigation and may be engaged in similar research. The reviewer may be someone whose own work favors and supports the hypothesis, or on the contrary, does not support it. In fact, an author can ask an editor NOT to send the manuscript to a particular person, presumably because the author believes that the reviewer might not be objective or is known not to support the hypothesis being examined. An editor will use discretion when evaluating a review from someone an author asked not to review it. A recently published paper of mine received 4 reviews. All reviews were anonymous; I include the gist and selected comments from each. Review 1- "Licht reviews recent evidence on the hypothesis that increased exposure of amphibian embryos to UV light is a factor in their world-wide decline. He concludes that most studies have shown no effect and that there are sufficient biological reasons that mitigate against a UV effect in nature. His arguments appear sound. Some changes should be made before publishing." Review 2- "I found the paper to be well written and exposed the previous experimental data as flawed." Review 3- "Thus, this is a very important contribution that deserves wide dissemination. This viewpoint is especially critical because it will force those who examine the topic to be more rigorous in their analyses (and perhaps more restrained in their reportage to the press!). Also this information may be useful to policy makers who are grappling with the issue of protection of amphibian populations." Review 4- "From the outset, the paper is a "strawman" argument and clearly displays Licht's lack of knowledge of the scientific method." "Licht's knowledge of photobiology is so rudimentary, many of the statements he makes are simplistic or inaccurate." This discussion of previous field work can be described as inaccurate and reflects Licht's ignorance of experimental research. Licht should read the literature more carefully and report the results accurately." Three reviews were very positive and one review provided no constructive criticism of the scientific content; it was nothing short of a personal attack on the author. What is clear is that this reviewer tried to sway the editor not to publish the paper by writing a personal hostile attack against the author. As happened in this case, a good, insightful editor will see through such a crass approach. Even though objectivity is the true parameter a reviewer should use, it is not always applied. The peer review of scientific papers is very critical to assure that published work has met the standards of scientific method and process. Why? In part, because as long as an hypothesis is supported and corroborated by other studies and not substantially disproved, research on that hypothesis should continue and should generate grants and financial support. Eventually, however, public or private funding for weak or very tenuous hypotheses will be unavailable. So a question remains. How does the review process apply to the ongoing publication of the UVB hypothesis, one unsupported by most other studies (see Table 2)? Several explanations exist. Perhaps the reviewers did not notice faults in the testing protocol. Perhaps the reviewers noticed, but did not think that experiments that negated the importance of natural defenses (e.g., dissolved organic matter, melanin, photolyase, egg jelly, water depth and oviposition sites) did, in fact, diminish the worth of the hypothesis. Perhaps reviewers may have favored the hypothesis for some less than objective reason. Perhaps they wanted to support the author(s) in securing another publication and, indirectly, sustain funding for further testing of the hypothesis. Such funding might include their own! A very important point I am trying to make is that just because a paper has been published in a peer reviewed journal, the merits of the paper should be judged with care and attention to detail. Each paper must be read with a clear objective mindset. This is especially true when the hypothesis being tested has almost become dogma; in such cases, the hypothesis is believed to be true because everyone knows it is true because it has been hyped to a point where no one bothers to question. Moreover, careful reading is exceedingly important when the hypothesis being tested involves the presumed effects of some agent on the current condition of our physical environment and/or life forms in it. When a popular, widespread and alarmist hypothesis -amphibians are dying from exposure to sunlight- is found to be erroneous, the public can lose faith in the rigor and worth of scientific statements in general. Another "cry wolf" story tarnishes the value of ongoing quality efforts and future studies that have real merit. Remember references can be found in the June 2003 issue of BioScience 53:551-561. Any comments or questions, contact L.E. Licht at lel@yorku.ca.